Artist talk with co-curators Calla Lachance & Daniel Rumbolt at 7:30 pm. Eastern Edge Gallery & The Festival of New Dance present a new creative exchange that explores intersections between visual arts and performing arts practices. The Guest Room is an experimental, interactive, collaborative space within the Main Gallery of Eastern Edge. This fluid exhibition invites the public to imagine, animate and activate the gallery in relation to one’s own ideas, impulses and object association. Entering the gallery, you will find everything you need to reimagine this ephemeral ‘Guest Room’. You are asked to take in the space, familiarize yourself with the items in the room, and then allow your imagination to redesign the environment in relation to your interests and curiosities. Feel free to move anything within the space – create your set and active the space how you desire. Any unused items will find a home in the holding trunk. This experimental exhibition explores the idea of reaction and activation of an ever-changing environment, where the occupants are unknown but have left their mark. You are now the continuation of this story. 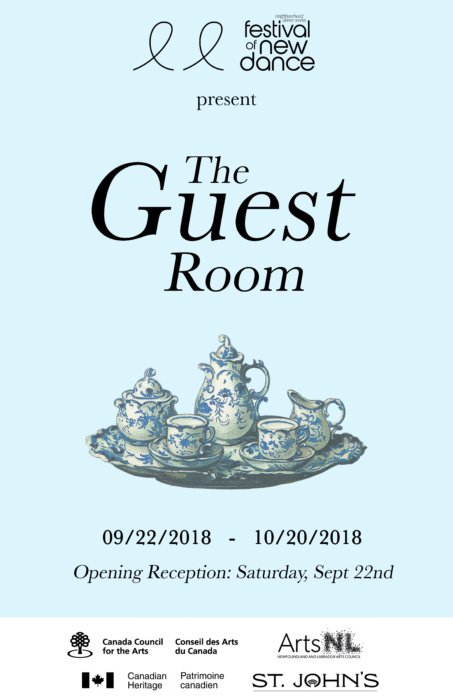 Be sure to share your curated space using #TheGuestRoom2018 so that everyone can follow along with the community-created narrative! What took place here? How has this space changed?